This cake recipe has been whipped together, layered in a pan, and popped into the oven three times in the past seven days… a true record for one who doesn’t covet desserts. I now refer to it as The Evil Cake as it has managed to entice, beckon and bewitch slices to disappear like magic. It’s really just an upside down cake, fairly traditional with that appealing caramel-like melt that gets heated up and laid down first in the bottom of a standard cake pan… later presenting as the top of the cake when the whole thing gets flipped over. 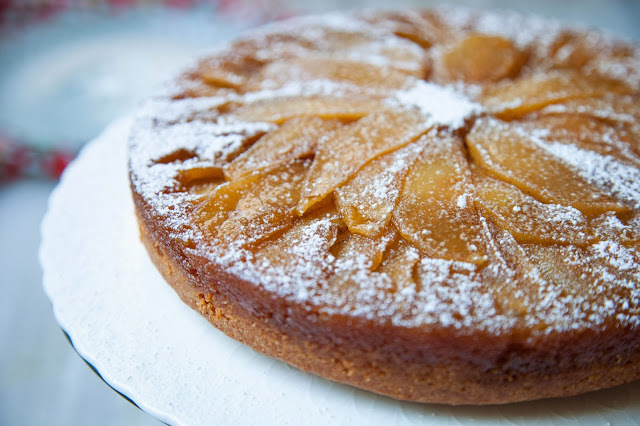 And while pineapple is often the fruit of choice in these flip-flop cakes, apples (from a generous delivery of Piñata apples from Stemilt Growers) were happily substituted in ALL three cakes that quickly disappeared. Quite honestly, I had no real intention of partaking in the initial cake I baked. It was a dessert made to please another. I simply cut a razor-thin slice to “test” it and whatever real intentions I may have had disappeared along with the cake. Besides being delicious, this cake is just too easy to make. It’s one pan, one layer. Perhaps, it’s this ease in assembly that contributes somewhat to its “evil” ways. And once you cool it a bit and flip it over to plate, that caramel-like melt that I mentioned earlier… well, it’s now bubbled into a gooey, sweet topping that’s made its way in and around the apples and over the sides of the cake, becoming slightly (and delightfully) crisp here and there. The apples are perfectly sweet and beautifully flavor-tinged with that brown sugar-butter caramel and light touch of cinnamon. And the cake is moist and just subtly sweet, making it the perfect complement to a rather luscious topping. 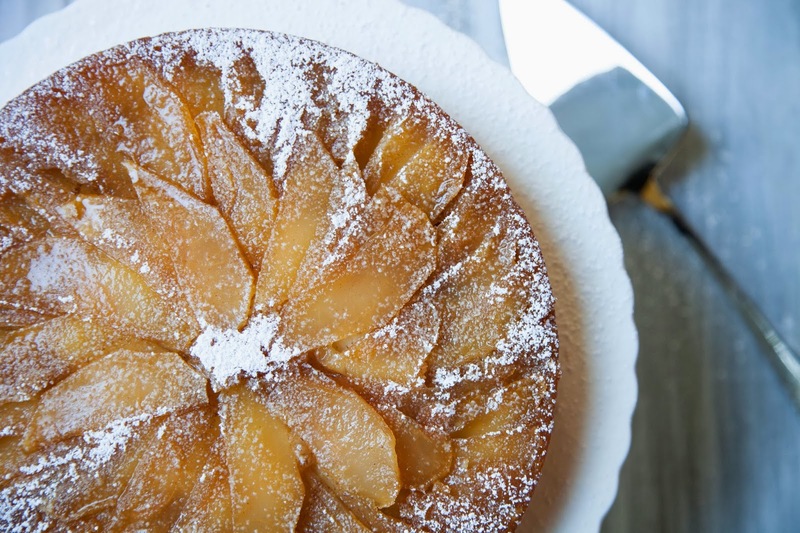 While the holidays may call you toward pies and such, this easy upside-down apple cake is definitely my simple, sweet choice for a holiday (any day) offering. Dust it with a little powdered sugar and a crumble of chopped pecans for a little dressier version, if you’d like. Either way… it will disappear. Heat brown sugar and ¾ stick butter in a small pot set over medium high heat, stirring occasionally, until completely melted. Add cinnamon to mixture and heat through. Set aside. Slice apples and transfer to a bowl. Add 1 tablespoon fresh orange juice to fruit and mix through. Set aside. Whisk (or sift) flour, baking powder and salt in a bowl. Set aside. In another bowl, mix ¾ stick softened butter until creamy and smooth. Add granulated sugar and mix until well combined. Add eggs, one at a time, mixing thoroughly after each. Add vanilla and 1 tablespoon orange juice and continue mixing until combined. Add flour mixture to sugar-butter mixture, in stages, mixing well between each addition, until all the flour mixture is fully incorporated. Batter should be slightly thick but pliable. Warm brown sugar mixture on stovetop, if needed, to loosen. Pour mixture into the bottom of a standard 9” cake pan. Tilt pan to spread mixture to edges. 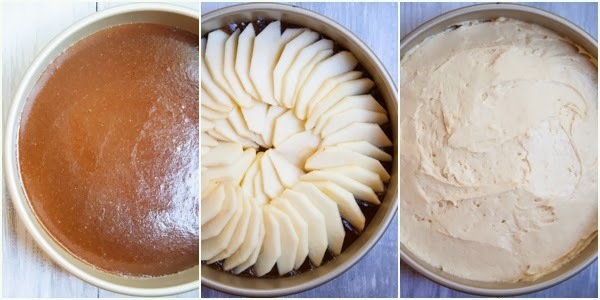 Arrange sliced apples atop brown sugar mixture, to cover. Drop mounds of batter over top of apples and carefully spread to edge of pan to seal perimeter and cover apples. Bake for 35 to 40 minutes, until golden and tester inserter comes out clean. Transfer cake to cooling rack for at least 30 minutes before inverting onto serving platter. (Once cake is transferred to rack to cool, you can run a knife around the outside edge to loosen. This will help in removing cake from pan later.) Once cooled and inverted, slice and serve. Dust with powder sugar and/or chopped pecans… or serve as is.